Do you know about the latest updates of Kurukshetra university jobs? Here is a great opportunity for all aspiring candidate to start your career in the Government sector by applying the posts on KU Recruitment 2019. Candidates should qualify in the test of Computer appreciation and application conducted by the organization, the test will be based on Introduction from Computer to till the skills of managing Email and Internet Browsing. 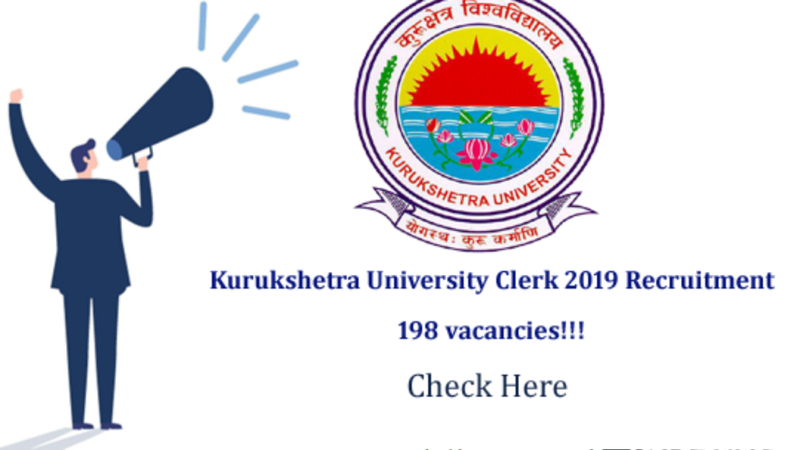 Candidates should have typing skill with the speed of 30 words per minute in English are eligible to apply the post- Kurukshetra University Clerk Recruitment 2019. Step 3: Click the suitable career options on the advertisement to apply for the postings in Kurukshetra University Haryana Recruitment 2019. Step 6: fill out the application by your original details and submit it through online along with the copy of scanned original documents for the selection process. Step 7: Check once whether you have attached the original educational qualification certificate from recognized organization to verify whether they are declared passed from educational institutions. Step 8: Block of A&B in Backward class should submit a competent authority issued by the Haryana government. The certificate should not be older than six months of the last date of application submitted. Step 9: CGPA/OGPA grading system is awarded based on degree/diploma percentage as mentioned per norms in the application form. Step 10: Be assured the scan copy of original certificates you have produced as per norms with the recognized documents for phase-4 selection. Step 11: finally upload your scanned photo and digital signature then pay the amount for applicants to submit the application through online. Step 12: Take a printout of application for future use.